How is 2017 vs. 2016? Total marks 250. Total duration: 3 hours. Date: 31/10/2017. Answer following questions each in 150 words x 10 marks. Among several factors for India’s potential growth, savings rate is the most effective one. Do you agree? What are the other factors available for growth potential? Account for the failure of manufacturing sector in achieving the goal of labour-intensive exports rather than capital-intensive exports. Suggest measures for more labour-intensive rather than capital-intensive exports. Examine the developments of Airports in India through Joint Ventures under Public-Private Partnership(PPP) model. What are the challenges faced by the authorities in this regard. Explain various types of revolutions, took place in Agriculture after Independence in India. How these revolutions have helped in poverty alleviation and food security in India? What are the reasons for poor acceptance of cost effective small processing unit? How the food processing unit will be helpful to uplift the socio-economic status of poor farmers? Stem cell therapy is gaining popularity in India to treat a wide variety of medical conditions including Leukaemia, Thalassemia, damaged cornea and several burns. Describe briefly what stem cell therapy is and what advantages it has over other treatments? India has achieved remarkable successes in unmanned space missions including the Chandrayaan and Mars Orbitter Mission, but has not ventured into manned space mission, both in terms of technology and logistics? Explain critically. Not many years ago, river linking was a concept but it is becoming reality in the country. Discuss the advantages of river linking and its possible impact on the environment. Discuss the potential threats of Cyber attack and the security framework to prevent it. The north-eastern region of India has been infested with insurgency for a very long time. Analyze the major reasons for the survival of armed insurgency in this region. Answer following questions each in 250 words x 15 marks. One of the intended objectives of Union Budget 2017-18 is to ‘transform, energize and clean India’. Analyse the measures proposed in the Budget 2017-18 to achieve the objective. “Industrial growth rate has lagged behind in the overall growth of Gross-Domestic-Product(GDP) in the post-reform period” Give reasons. How far the recent changes in Industrial Policy are capable of increasing the industrial growth rate? What are the salient features of ‘inclusive growth’? Has India been experiencing such a growth process? Analyze and suggest measures for inclusive growth. What are the major reasons for declining rice and wheat yield in the cropping system? How crop diversification is helpful to stabilize the yield of the crop in the system? How do subsidies affect the cropping pattern, crop diversity and economy of farmers? What is the significance of crop insurance, minimum support price and food processing for small and marginal farmers? Give an account of the growth and development of nuclear science and technology in India. What is the advantage of fast breeder reactor programme in India? ‘Climate Change’ is a global problem. How India will be affected by climate change? How Himalayan and coastal states of India will be affected by climate change? On December 2004, tsumani brought havoc on 14 countries including India. Discuss the factors responsible for occurrence of Tsunami and its effects on life and economy. In the light of guidelines of NDMA (2010) describe the mechanisms for preparedness to reduce the risk during such events. Mob violence is emerging as a serious law and order problem in India. By giving suitable examples, analyze the causes and consequences of such violence. The scourge of terrorism is a grave challenge to national security. What solutions do you suggest to curb this growing menace? What are the major sources of terrorist funding? If large chunk of answer is available at a single standard reference source, then I’ll count material availability as yes. If answer is scattered across multiple less-known / less used sources, then I’ll count as “no*”. It doesn’t mean that given question is unsolvable, it only means that it requires much more effort. Yojana March 2017: page 35 onwards- “SWOT analysis of Indian Economy” by IIM Professor and member of monetary policy Committee -Dr.Ravindra Dholakia. Other factors include: channelizing of the savings into investment in private sector, rather than crowing out because of fiscal repression. All of this, sufficiently covered in my BES17 series. 2. Suggest measures for more labour-intensive rather than capital-intensive exports. Economic survey has been highlighting this since last three years. Leather and garment industry has max. potential for job creation for every 1lakh invested but labour laws, port infrastructure, tariff anomaly and absence of FTA prevent these sectors’ growth, and therefore jobs. Ref: my lecture. 4.how Agri. revolutions have helped in poverty alleviation and food security in India? Verbatim answer given in Kurkshetra 2016 March PDF page 5 onwards in Sandip Das’s article. P24 onwards: Green Revolution Phase-I and II. 5.why poor acceptance of cost effective small processing unit? How the food processing uplift poor farmers? Second part of the question easily available in my [food processing] article series. 6. what stem cell therapy is and what advantages it has over other treatments? Yojana December 2016 Page 51 short note is given. Available in the science-technology section of any general studies manual. Even Mrunal’s article (though I don’t claim credit for it, as its 4 years old so present generation of aspirants would have not read it. वेसे भी lengthy CSAT Paper-II और अतरंगी Prelim GS1 के चलते इस साल पुराने चावल तो कम ही पास हुए दीखत रहे है. 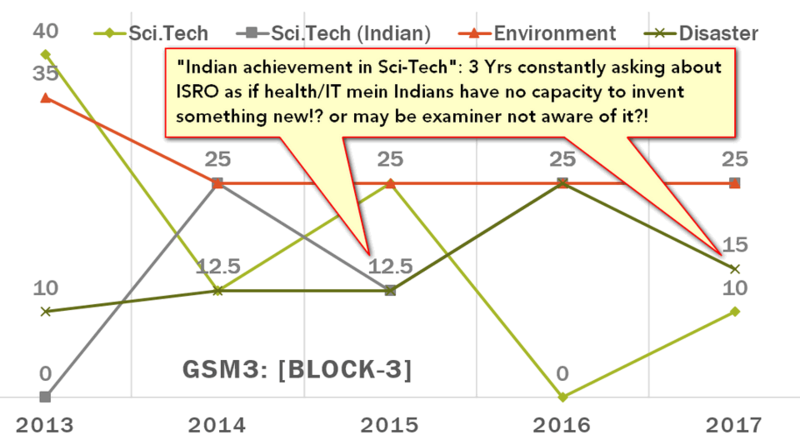 7.India has not ventured into manned space mission? Explain critically. April 2017: PTI reported that ISRO is working on a human space flight Programme. New research required in life support systems, improved reliability and safety, crew escape system, etc. estimated cost Rs.10,000 crore spread over a period of 8 years. The real challenge is dragging these points into 150 words. 8. advantages of river linking and its possible impact on the environment. Clichéd topic, beaten to death. Verbatim answer also given in Yojana-2016 July page 23 onwards in Mr.R K Sivanappan’s article on the same subject. 9. Cyber-attack and the security framework in India? Entire budget-2017 and its initiatives have been amply covered in my BES17 lecture series. 12 Recent changes in Industrial Policy are capable of increasing the industrial growth rate? 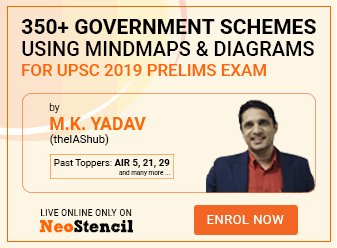 Seems UPSC examiner framed this question like a Postdated cheque because DIPP had announced it’d launch new industrial policy in September / October 2017. but on their website only a discussion paper is available. So in absence of concrete info, I think most candidates would have made stories around FDI relaxation, ease of doing business and startup registration. Essayish question. You’ve to link SDG goals with government initiatives. 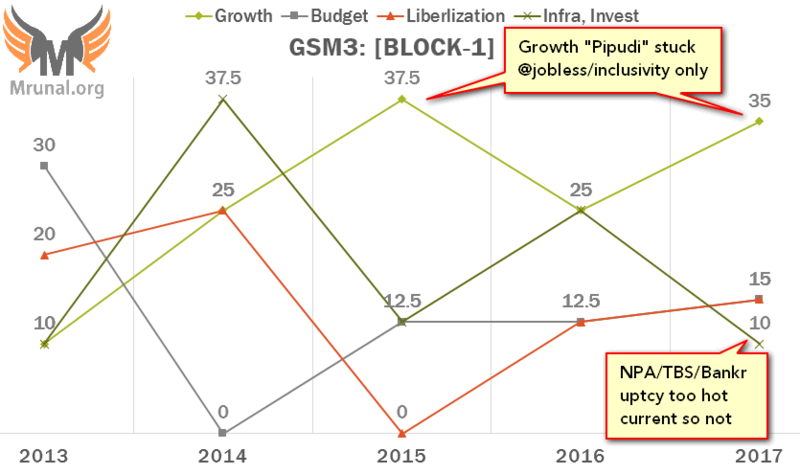 Plenty of points available in NITI3YR PDF as well as my economic survey lecture series. 14.why declining rice and wheat yield in the cropping system? How crop diversification can help? Ref: ShankarIAS’s Agriculture book Page17 onwards. 16. nuclear science and technology in India. Science Technology portion in any General Studies Manual. ShankarIAS Environment Book “Ch.20: impact of climate change” has sufficient points for answering this question. 2nd ARC 5th Public Order: page 8 onwards. It talks about “Communal riots” but you can easily recycle the same points for ‘mob violence’, along with some new developments such as (1) fake news and (2)declining tolerance in Indian society (both I had covered in my Answer writing series). 20.terrorism? 2nd ARC 8th Report. How to curb menace? Just cite points given in ‘summary of recommendations’ at page 137 onwards. Terror Funding is given in Chapter 6. 16 out of 20 = 80% of the questions directly covered in standard sources. And 2 questions: partially available in standard sources. So total 90% of the paper is fully or partially covered in sources that are either free or very cheap. And majority of them from Economic Survey, Yojana, Kurukshetra and 2nd ARC : all freely available on internet. Therefore, expensive coaching and study material is not necessary for success. Mains Success primarily depends on your ability to write less mediocre answer than others, in given time limit. So, before scavenging for “Secret” material and compilations for 24/7 basis on telegram groups, you should first finish these standard reference sources. Now coming to the analysis part…. Nothing from artificial intelligence, drones or robots this time, even though they were hot topics in science-tech in GSM3. Nothing from black money, although it was a hot topic in the aftermath of demonetization and passing of new bills related to black money. Nothing from NPA, TBS problem. Instead of asking “funding to Kashmiri stone-pelters” specifically, they asked about “funding to terrorism” in general. Nothing from D.B. Shekatkar committee report on defense reforms or Dokhlam crisis. Senior players were expecting question in ‘security forces / border areas’. Nothing from GST (but in fairness, it was asked in GSM2-2017). 2015: The nature of economic growth in India in described as jobless growth. Do you agree with this view? Give arguments in favour of your answer. 2014: While we found India’s demographic dividend, we ignore the dropping rates of employability. What are we missing while doing so? Where will the jobs that India desperately needs come from? Explain. 2016: How globalization has led to the reduction of employment in the formal sector of the Indian economy? Is increased informalization detrimental to the development of the country? 2016: Comment on the challenges for inclusive growth which include careless and useless manpower in the Indian context. Suggest measures to be taken for facing these challenges. As you can see, their pipudi (small-flute) is stuck at the same things since last three years. 2014: What are the reasons for the huge growth of services vis-a-vis industry in the country? Can India become a developed country without a strong industrial base? “Industrial growth rate has lagged behind in the overall growth of Gross-Domestic-Product(GDP) in the post-reform period” Give reasons. How far the recent changes in Industrial Policy are capable of increasing the industrial growth rate? 2017: In what way can flood be converted into a sustainable source of irrigation and all-weather inland navigation in India? (here you’ve to write about river interlinking) 2017: Discuss the advantages of river linking and its possible impact on the environment. 2016: Major cities of India are becoming more vulnerable to flood conditions. Discuss. 2016: Discussing the reasons for urban floods. highlight the mechanisms for preparedness to reduce the risk during such events. 2016: The basis of providing urban amenities in rural areas (PURA) is rooted in establishing connectivity. Comment. 2017: What are ‘Smart Cities? Examine their relevance for urban development in India. Will it increase rural-urban differences? Give arguments for Smart Villages’ in the light of PURA and RURBAN Mission. Explain how private public partnership agreements, in longer gestation infrastructure projects, can transfer unsuitable liabilities to the future. What arrangements need to be put in place to ensure that successive generations’ capacities are not compromised? 2013: specific question about “Pink Revolution” in food industry. 2017: asked “general” question about all agriculture revolutions that occurred since independence. 2013: general question on subsidies to farmers @national and state level, and how do they create distortions? 2017: asked subsidies’ impact on specific things: How do subsidies affect the cropping pattern, crop diversity and economy of farmers? 2016: general question on how space-tech benefits socio-economically. 2014: general question on why scientific research declining in universities? As such UPSC examiner’s affection for space-tech continues for third year running- 2015, 16 and now 17- again asked about it. 2015: India’s preparedness against Earthquakes. (specific) 2017: India’s preparedness against Tsunamis (earthquakes in oceans). Again specific. In 2016 asked about allelopathy (extremely technical agro topic meant for perhaps IFoS and Agriculture optional). Thankfully no crazyness this time. How is 2017’s Paper compared to 2016? In both 2016 and 2017, majority of the questions came from contemporary issues i.e. topics older than one year. But in 2017, there is heavy focus on contemporary issues, over 75% questions from this area only. 2017 has just two theory questions: 1) factors affecting growth potential (2) principles & benefits of stem cell therapy. In every other question – at least partially they’ve asked some contemporary issue e.g. crop-diversification benefits is “theory” but simultenously they asked in the same question “why rice-wheat yields declining (in recent times)? 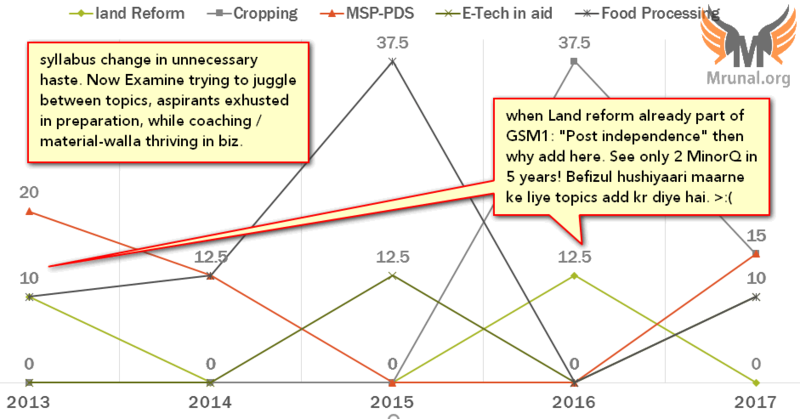 Implications: rather than doing haay-haay for ‘next’ current affairs, one should look back at what has been happening in last 3-5-7-10 years in contemporary perspective. Write Opinion, assessment, suggestion, prospects. Discuss whether good x is true but bad y is also happening. Just describe, narrate things as they are, steps that already taken, without judging their merit / impact. In 2017, there is slight increase in the ‘opinion / assessment’ type questions. Total 4000 words. Total 4000 words. Length wise there is no difference, but paper is tougher because this time more ‘contemporary, opinion, analysis’ type questions where you’ve to pause, think, arrange points in logical sequence and then answer. यदि काले धन के बारे में पूछना ही नही तो सिलेबस में रख्खा क्यों है? Excellent analysis.. bery useful one. Brilliant ! Thank you Sir, for such a detailed and comprehensive analysis. This is immensely helpful for students like us it helps us know about the nuances of exam. Thanks sir for analysis these difficult fectors. How can i download five years topic wise question papers?